"Lina Bo Bardi + Roberto Burle Marx"
Shown alongside never before seen textiles, drawings and prints by Burle Marx. The exhibition will be on view from March 24 through April 30, 2015, with an opening reception on Tuesday, March 24 from 6-8pm. One of the few women designers of Brazil’s modernist era—and of the modernist era as a whole—Lina Bo Bardi (1914-1992) had a strong influence on the culture of the country with her groundbreaking magazine,Habitat, and her design of furniture, architecture, and public spaces, including the São Paulo Museum of Art and the SESC-Pompéia Center in São Paulo. 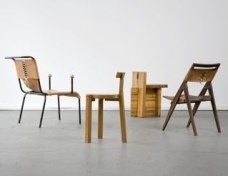 The dining set in the exhibition was created by Bo Bardi with designers Marcelo Ferraz and Marcelo Suzuki for the SESC-Pompéia and represents the ideal of a furnished public space featuring well-executed, inspiring, and functional designs. Because she had so many projects, Bo Bardi’s output was limited, and virtually every Bo Bardi work has become an icon. The collection here shows her talent for creating forms that are beautifully minimal, with an exceptional combination of details that reveal her modern thinking as well as respect for old world elegance. Roberto Burle Marx (1909-1994) is considered by many to be the godfather of 20thcentury Brazilian landscape design and is internationally renowned for his tropical gardens and mosaic walks such as the Copacabana beach promenade. Burle Marx studied painting as a child in his native Germany and later at the National School of Fine Arts in Rio de Janeiro. Strongly influenced by abstract art and Brazilian folk art, Burle Marx developed a unique dialogue between his garden designs and his artistic works, with each echoing and inspiring the other. The collection on view at R & Company includes many pieces never before seen by the public, including totemic wooden sculptures, drawings, textiles and prints. Both Bo Bardi and Burle Marx were born in Europe and immigrated to Brazil, and their work marries European sensibilities with the sensuality and rich natural materials available in their adopted country. Seen together, the works offer a window into the immensely creative energy in Brazil’s design scene in the second half of the 20th century. 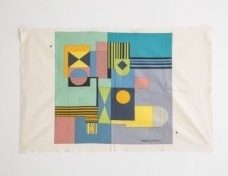 Multi-colored Roberto Burle Marx textile with printed signature. [Dimensions below are for the fabric itself, the print measures 31.5" x 30"] 51" L x 33.5" W / 129.5cm L x 85.1cm W.